I recently wrote about pumpkin spice done right with a batch of cinnamon rolls I created, and now I have another fresh pumpkin spice recipe for you just in time for the holidays. 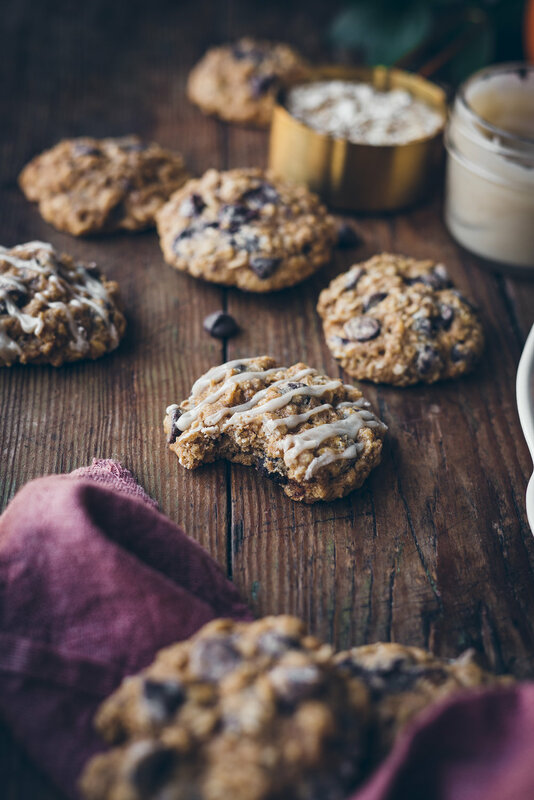 This is a solid batch of oatmeal cookies, replete with delicious chocolate chips and a texture to die for. I snuck just the right amount of pumpkin spice into this, and just like that it’s become one with Fall—an established recipe with a touch of appropriate seasonal spice. Follow the recipe below and bring a treat to Thanksgiving that your family will fight over. 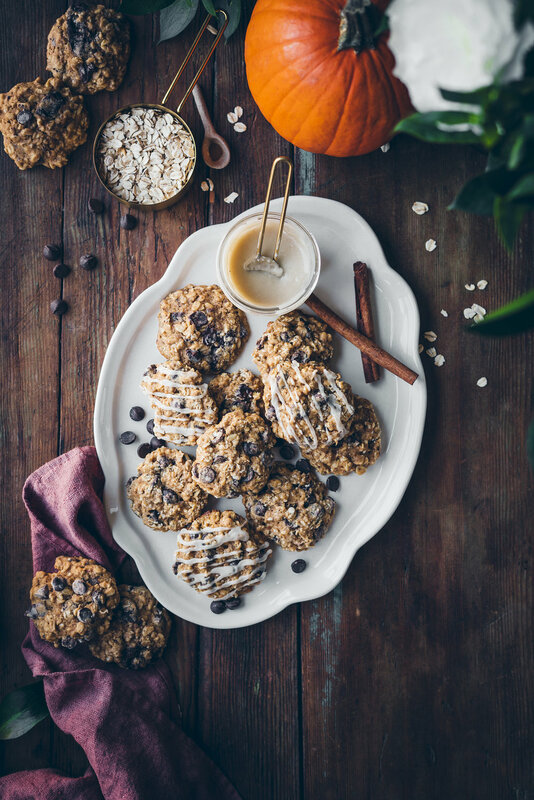 In a medium bowl mix together the both flours, oats, baking powder, sea salt, cinnamon, pumpkin spice, and cardamom until well combined. Cream brown sugar and butter until light and fluffy. Then beat in the egg until fully combined. Next, mix in the maple syrup, pumpkin puree, and vanilla. The mixture will likely look curdled at this point, but that’s okay. With the mixer on low, slowly incorporate the dry mixture into the wet. Once the everything is just about combined add in the chocolate chips and mix on low for a few seconds more. Cover the mixing bowl tightly with plastic wrap and place in the fridge for an hour, or overnight. When you’re ready to bake pre-heat oven to 350 F°. Place about 12, 2 tablespoon sized portions of dough on a lined cookie sheet and bake them for 12-13 minutes. The edges should be set and the center might slightly look shiny, which is totally fine. Let the cookies cool on the baking sheet for 5 minuets then transfer to a baking cooling rack. Continue this process until you bake off all of the cookie. Makes about 3 dozen smaller cookies. Mix together glaze ingredients until smooth. If the glaze seems a little thick, add a splash more milk add need until a glaze-like texture is achieved. 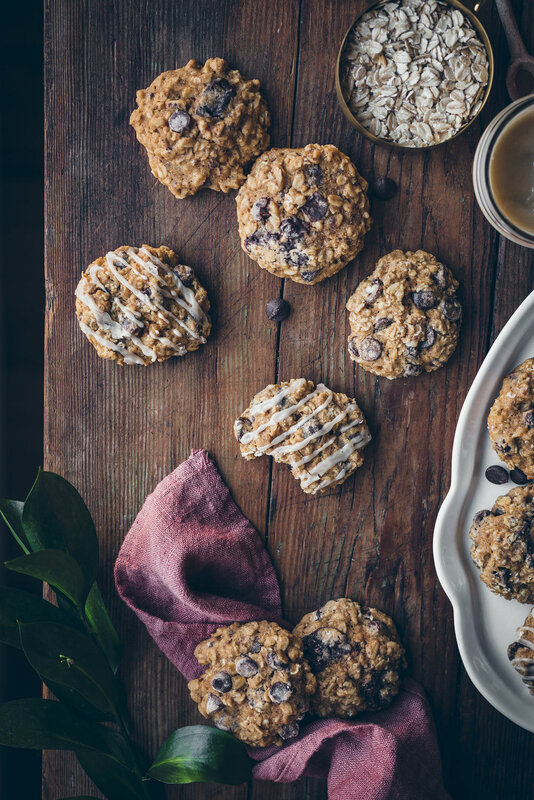 Drizzle the glaze over the cooled cookies and enjoy!